Food Fun Facts - A+ Lunches / Fiesta Catering Inc. Fill half your plate with fruits and vegetables – The fresher the better! 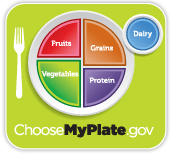 Fill a quarter of the plate with a lean meat/protein – Beans, yogurt, and eggs are great sources of protein. – Try whole grain breads and pastas, for increased fiber. – The best choices are Fat Free or 1%.